Instead of arriving flustered and stressed, here’s how I’m beating the clock. Locke Hughes, freelance writer. health coach lockehughes.com. I tend to be type A in most areas of my life. I hate having dirty dishes in the sink; I love meeting deadlines at work; and I make my bed (almost) every day. But when it comes to punctuality, I’m most certainly more type B.
I’m usually running late—not hours late but a solid five to 10 minutes behind schedule. My close friends and family tease me about it. More than once, someone has told me a dinner reservation was 15 minutes earlier than it actually was to avoid losing our table. And while I’d never miss a meeting at work, I’m also never the first person at the office. Telling a late person to be on time is a little like telling a dieter to simply stop eating so much. The thing is, I hate being late. It makes me more anxious than I already am, and I know it doesn’t make a wonderful impression on others. I usually end up texting friends, “Be there in 10, sorry!” though I know it’s no excuse. I always feel guilty for showing up late, whether it’s a doctor’s appointment or a workout class. And New York City naturally has plenty of time-sucking obstacles (traffic jams, stuck subways, long lines) that can pop up without notice, so constantly running late takes my daily stress levels up another notch. Even worse, experts say being consistently tardy signals someone is easily distracted, disorganized, self-centered, and generally inconsiderate. Ouch. Since I don’t believe I possess any of the above qualities, I recently decided it was time to get my time-management skills in order. For one week, I committed to following these seven expert-sourced tips for being a more prompt (and focused, organized, and respectful) human being. 1. Admit you have a problem. 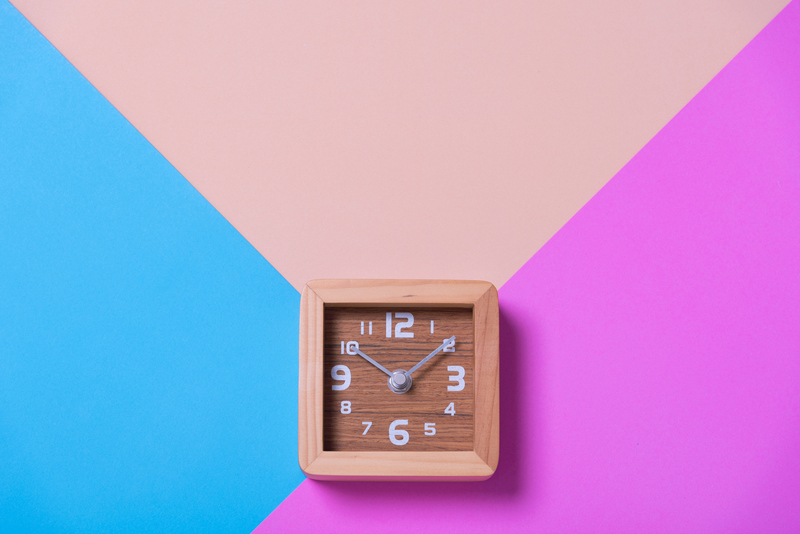 It’s tempting to downplay your delays, but the first step to being punctual is accepting you have a punctuality problem, writes Marelisa Fabrega, a self-growth and productivity blogger. While my closest friends know my dirty little secret, an informal poll revealed most of my colleagues didn’t consider me “late”—which is awesome. What they don’t know is that I feel a tightness in my chest every morning until I finally sit my down at my desk. Or that I skip morning workouts because I just don’t get out of bed. Or that I’ve been thisclose to missing two flights this year. Even though my tardiness wasn’t obvious to people in my life, it had become a problem for me. And I finally admitted it’s something I need to fix. There are several reasons why people are perpetually late to the party, according to DeLonzor. Some fit the classic “absent-minded professor” archetype: They’re easily distracted, misplacing car keys, getting lost, or completely forgetting appointments. Others are adrenaline junkies who love the thrill of being late—running to catch a train or rushing breathlessly into a crowded auditorium. Or maybe someone is asserting their power (“I’m such an in-demand, important person that everyone else can wait for me.”). One human behavior expert even suggests someone may be late because they’re feeling guilty over some other act—and being late gives them an opportunity to apologize for other, unabsolved sins. Whenever I have somewhere to be, I feel like I need to do just one last thing before I leave—which in turn causes me to fall behind schedule. While these all sound pretty sinister, for me, it really boils down to a false sense of being productive, or what some experts call “One More Task Syndrome.” Whenever I have somewhere to be, I feel like I need to do just one last thing before I leave, which in turn causes me to fall behind schedule. Doctor’s appointment in 30 minutes? Sure, let me just send 10 emails before I leave. Eight o’clock dinner? OK, but I want to re-organize my bathroom cabinet first. Early a.m. workout? Well, I really want to buy a coffee on the way to the gym—it’ll help me push harder, right? 3. Just say “no” to nonessential to-dos. To put an end to this last-minute dash, I tried to differentiate between tasks that I absolutely must do and tasks that can wait. (Hint: Most can wait.) Do I really have to empty the dishwasher before leaving for work? Or pick up my dry cleaning? No! I simply made myself stop whatever nonessential chore I was doing when it was time to leave my apartment or even the office. Research shows that people who try to do more than one thing at a time (known as “polychronicity”) are more likely to be late to work. So when I found myself cleaning the apartment before my morning commute or over-committing to plans in one evening, I stopped and forced myself to be more realistic about what I could do in that timeframe. I even cancelled plans with a friend one night to give myself adequate time to work out, relax at home, and prepare for a trip. Turns out Mom was right all along. Growing up, she’d insist I lay out my clothes for the next day on my other twin bed, hoping it would cut down on the interminable waiting time for me to get ready for school the next morning. So at 27, I reenacted her advice: Every night, I picked out my clothes for the next day. I put my keys, wallet, and iPhone in the same place by the front door, and I also kept my sunglasses and umbrella there so I’d be prepared for any kind of weather. Another trick to speed up my morning routine? I kept my outfits as basic as possible (think: jeans, simple shirts, and the same jacket and shoes every day). This saved me a ton of time and decision-making on hectic mornings. 5. Expect the worst (and plan accordingly). It sounds counterintuitive, but when it comes to being punctual, it’s better not to be optimistic. As Fabrega points out, “things are not going to run smoothly 100 percent of the time.” Translation: Allow yourself plenty of extra time. You never know when there might be subway delays or construction on the roads (like that time when a six-lane highway shrank to two on the way to the airport). I had to define exactly what it means to be “on time.” In an office where we don’t have set hours (I know, lucky me! ), I decided to set my start time at 9:45 a.m. For other scenarios—dinner with a friend, a workout class—my start time would be a few minutes before the actual event time, as experts say you should plan to arrive early rather than on time. The biggest test of the week? Catching two trains and a flight. For the train, I decided “on time” meant getting to the station 30 minutes before the train was scheduled to leave. At the airport, it meant getting there 90 minutes before my flight time (instead of my usual 45). Arriving early in each scenario made traveling a lot less stressful. 6. Get real about timing. I like to believe Google Maps overestimates the time it takes to get places: 17 minutes? Yeah, right—I walk fast. I’ll get there in 10. (This is never true.) I also like to believe I can get ready for work in 30 minutes, max. (False, again.) And the worst habit of all? Thinking I need to leave my house only 90 minutes before my flight takes off. Turns out these aren’t just my horrible habits. They’re examples of a psychological phenomenon called the “planning fallacy.” Researchshows people tend to underestimate how long a task will take them to complete, since we base our predictions on an overly optimistic view of the past. DeLonzor calls it “magical thinking,” something that chronically late people love to indulge in. To overcome this bad habit, I had to re-learn how long certain tasks actually take. Maybe I can get ready for work in 30 minutes, but 40 is a lot more realistic. And sure, Google Maps says it’ll take 10 minutes to walk to that restaurant, but really, it’s going to take 15. I finally accepted that I couldn’t underestimate the time things take. I got over my “overly optimistic” thinking, got on a new schedule, and ended up arriving a few minutes early almost everywhere I went. 7. Use wait time wisely. Bring a book everywhere you go, pre-load interesting articles to the Pocket app, or queue up a podcast series. (And get over worrying about how you look while waiting alone—no one is noticing you!) While I was never quite early enough to spend quality time reading this week, I did look forward to listening to a podcast on my more leisurely strolls to the office. And waiting for a workout class to start was way more pleasant reading on my phone than mindlessly scrolling through Instagram. By no means am I suddenly a productivity pro. But after one week of following these tips, I can’t see myself ever going back to my old, time-pressed ways. This experiment made me realize it’s possible—without much effort at all—to feel more in control and less anxious on any given day. I also felt much more like a responsible adult when I consistently showed up on time to all my obligations, personal and professional. Case in point: About one month ago, I was in a cab to the train station, heading to an out-of-town wedding. I’d been rushing to pack, and I’d left later than I intended. The traffic was stuck and the minutes were passing so I texted my friends I was supposed to meet to say I might not make the train—go without me if so. Sitting in that cab, I felt sad, stupid, and lazy (although I did make it, with only one minute to spare). In contrast, before another train trip this past weekend, I got totally prepared the night before. I left my apartment right on time (with a few extra minutes as a buffer) and arrived at the station feeling calm, collected, and even relaxed. I met my friend, grabbed an iced coffee, bought my ticket, and flipped through a magazine as I waited for the train. There’s no question which experience I want to repeat every time from here on out. Hi! I'm a freelance journalist for sites such as The Huffington Post, Women's Health, SELF, Shape, and Greatist, among others. My goal is to empower people with the knowledge and tools to lead happier, healthier lives. I also work one-on-one with individuals as a certified health coach and trainer. Learn more about me at lockehughes.com. Be Kind. Always. Because You Never Know.